You can select a specific area in your preview image to include in your scanned image. You can select the entire image area or a portion of it. 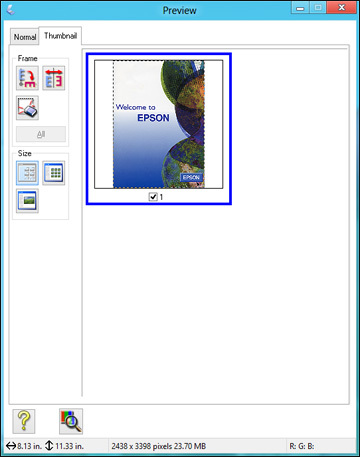 You can even select multiple scan areas to create multiple scanned images of different areas (Normal Preview mode only). Note: In Professional Mode, the default Preview mode is Normal mode. To use Thumbnail Preview mode instead, click the Thumbnail tab. Normal preview: Click the Auto Locate icon to create a marquee (dotted line) on the preview image. Thumbnail preview: Your scan area is selected automatically, but you can change it. Place your cursor in one corner of the desired scan area, then click and drag the cursor to the opposite corner to create a marquee (dotted line) on the preview image. Normal preview: To create additional marquees (up to 50, if available), click the Copy Marquee icon to copy the existing marquee and paste it on the preview image. Thumbnail preview: To change the preview style, click one of the Size icons. 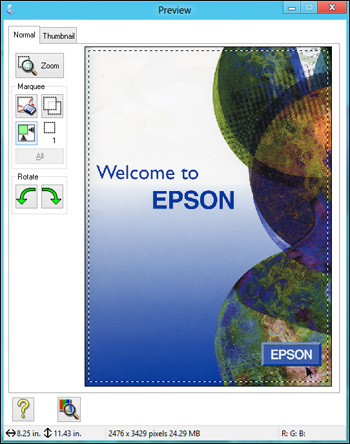 Click inside the scan area and make any necessary settings in the Epson Scan window.